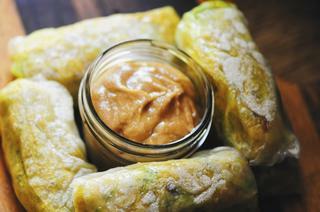 Hearty and comforting curried red lentil spring rolls with a creamy lemon-ginger tahini dipping sauce. Delicious, healthy, filling, & easy to make! As the air begins to carry a hint of autumn, I find myself desiring meals with a certain warmth & heartiness about them. These red lentil spring rolls are once such meal. They are full of wholesome and nourishing ingredients (and, protein! ), and combined with a delectable dipping sauce -- they make for one incredibly tasty and satisfying meal as well. This creamy dipping sauce now: amazing. And, these spring rolls: a perfect medley of textures & flavors! So, whether you are swinging by for the toasted and filling deliciousness of these beautiful red lentil spring rolls, or the versatile yumminess of this incredible creamy tahini dipping sauce, you are certain to find a belly full of happiness, this I know. . . In a large skillet over medium heat, heat 1 tbs coconut oil.Sauté onion & garlic until softened & beginning to brown - about 5 minutes.Stir in your cooked lentils and broccoli, followed by all spices. Cook for a few minutes until all is well combined. Turn off heat, set aside.Take one rice paper wrapper & dip it in a large bowl warm water until slightly softened.Lay rice paper flat on a cutting board & spoon 2 tbs of lentil mixture into the center. Fold the bottom up & over mixture, followed by folding each side in. Starting at the bottom, tightly roll upwards until you have one spring roll. Repeat with remaining ingredients until you have 9 spring rolls.Heat 1 tbs of coconut oil in a skillet over medium heat. Place spring rolls (in batches) into heated skillet.Fry for a few minutes, flip, and fry for a few more minutes, or until desired crispiness is achieved.Let cool before serving (with lemon-ginger tahini dip! }Lemon-Ginger Tahini Dipping Sauce:Combine all dip ingredients. Whisk until smooth. Refrigerate any unused portion for up to one week.Enjoy!